Quality Gold has acquired De-ani, the Monrovia, California manufacturer best known for their meticulously designed and unique Karat Gold and Sterling Silver Pendants. All De-ani merchandise has started invoicing and shipping from Quality Gold in Fairfield, Ohio. In May, Quality Gold will publish a comprehensive Charm & Pendant catalog including the De-ani Collection. Throughout the next year, new De-ani styles will be added to product categories online at QGold.com and in printed QG catalogs. All items will be stocked in Fairfield, Ohio and will be available with no minimum order requirements. Quality Gold, Inc. is a worldwide company founded in 1979 and headquartered in Fairfield, Ohio with operations in Fairfield, Ohio; Toronto, Canada; Arezzo, Italy; Mumbai, India and Lima, Peru. Celebrating 40 years of actively serving more than 22,000 retailers across the United States, its territories and within Canada, Quality Gold offers more than 200,000 jewelry & gift products available to ship same day and more than 125,000 items available special order for sale to retailers. Quality Gold has built its business on the companyâ€™s commitment to provide the largest selection of products, the best service, and the best value to its customers. For more information, please visit www.QGold.com. De-ani Inc., is a worldwide company headquartered in Monrovia, California. De-ani Inc.â€™s reputation is world renowned as a manufacturer of matchless imaginative and creative treasures, surpassed by none. 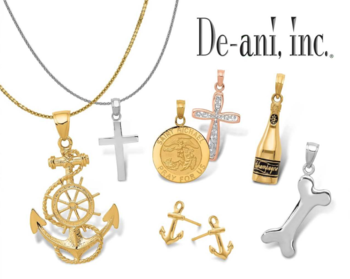 Established with the objective to offer the jewelry industry finer quality and meticulously designed pendants at an affordable offering, De-ani, Inc. offers the industriesâ€™ finest collections of sea life, religious, novelty, fashion and enamel jewelry. Collections include pendants, bracelets, earrings and slides; all designed and manufactured to represent the unsurpassed detail and quality that is undeniably a De-ani trademark.